I Top 8’d my first Pro Tour Qualifier in January with R/G Monsters. This, however, was a different time, when Domri Rade was legal and there were dozens of control decks lurking about, waiting to be crushed by Stormbreath Dragons. It was also a time when Lifebane Zombie was legal, often forcing green mages like myself to toss aside Polukranos, World Eater in dismay. Clearly, the deck is powerful if it can take down a Grand Prix. So, what are its weaknesses? The 0/4 I’m referring to is Lagonna-Band Trailblazer. You may notice it’s in the sideboard here—I actually spoke to Orry after the tournament, and he confessed that he built his deck incorrectly, forcing him to side in all three Trailblazers every game. The abundance of conditional removal in the format, such as Bile Blight or Lightning Strike, often makes it very difficult to deal with this card, and even just having a turn-one play with this deck can make all the difference. The reason this deck is so powerful is its resilience and speed. Gods Willing and Feat of Resistance allow you to gain value from countering your opponent’s spells. This is a deck that I would choose with the third deck-selection method. It’s been under the radar for a while now, and it’s just been waiting for a breakout performance. With the right hand, which isn’t difficult to sculpt with some careful scrying, it is nearly impossible to beat except by one deck in the format. 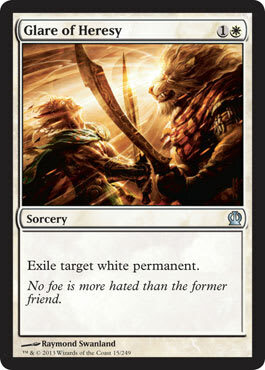 Crackling Doom laughs in the face of conditional, targeted removal. W/U Heroic’s best creature is always its biggest one, which makes Crackling Doom an utter catch-all in the matchup. Additionally, the deck is actually capable of applying a great deal of pressure with Seeker of the Way and Goblin Rabblemaster. The real nail in the coffin is Sorin, Solemn Visitor. Gaining life off the two or three creatures you probably have on the battlefield by turn four can sometimes put the game out of reach immediately against most decks in the format. You’ve heard it before: no bad matchups, no good matchups, low synergy, but powerful cards. It’s the quintessential midrange deck and precisely what falls under my aforementioned play style. I was most concerned about facing Hornet Queen decks, which is where the Fleecemane Lions and End Hostilities come in—I want to establish an early board presence and force my opponent to answer me rather than the other way around. If that doesn’t work out, I have a panic button. If you find yourself in a feature match, don’t panic. It’s natural to feel the pressure here, but remember this: Some of the best players in the world have probably lost more games on camera than you’ve played in sanctioned tournaments. Should you have the opportunity to play on camera, it’s no more impactful than any other match you’ll play all day. Don’t’ be afraid to call a judge. This has been a common topic of conversation recently, but two of the guys with whom I traveled to the tournament faced the same opponent who tried delving fewer cards than he needed to for what we’re quite sure was to achieve an advantage (cheating). Don’t be discouraged by an “unwinnable” matchup. I would consider Reanimator and W/U Heroic to be very difficult for Abzan—though I won a match against each in the tournament. There’s always a way to win a match; just find out what it is, and execute. I finished day one at 9–0, only losing a single game all day. I was careful not to let it get to my head, however, as I knew I was facing another undefeated player in the morning: probably the well-known pro David “Web” Ochoa. I was correct. My first match on Sunday was on camera—my first time ever—against Web himself. 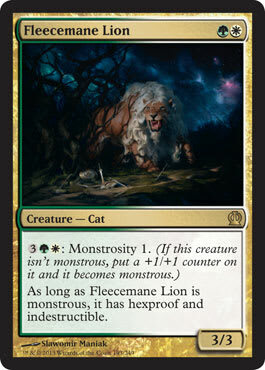 In Game 1, I did the Abzan thing: play awesome creatures, kill enemy guys, gain some life, win. Game 2 was a little rough. I ’boarded out my Fleecemane Lions due to Lightning Strike, which, in retrospect, I believe to have been a wrong decision. In this matchup, it’s important to apply pressure, and soaking up a Lightning Strike isn’t the worst thing one of your cards can do. I also left a revealed Hero's Downfall on the top when I could have shuffled it away with a fetch land—something the coverage team pointed out. I wanted to make sure I didn’t take any damage from creatures, but as it turned out, Web didn’t play any, and I was just stuck trying to put a threat into play. He was able to counter just about everything and burn me out eventually. In Game 3, we had some back and forth. It came down to a clear board with Web at 2 life. He had a Suspension Field in play exiling a Siege Rhino of mine. I’d scried a Glare of Heresy to the bottom of my deck early on in the game, and I realized if I shuffled away a couple of fetch lands, maybe there was a chance it’d find its way back to the top. Sure enough, I ripped the one-of, and Ochoa Lightning Striked himself in a classy concession. My time as the only undefeated player in the Grand Prix was short-lived. Another Houston native, Angel Solache, defeated me in a mirror match the next round after I saw my first bad draws of the tournament. Orry Swift routed me with W/U Heroic—the way the matchup should go assuming the W/U player is competent and draws well. I next played two rounds against Mardu Midrange. In this matchup, I often find myself in situations that seem lost, but in reality are far from it. As an Abzan player, imagine facing down a Seeker of the Way, three Goblin tokens, and a Sorin, Solemn Visitor. I found myself in this very same situation in Round 13, with my opponent at 43 life. A Hero's Downfall and a Siege Rhino later, my opponent could no longer attack. At this point, I was able to draw into the Top 8—a pretty fantastic feeling. I lost to Orry’s W/U Heroic again in the quarterfinals, and he ended up making it to the finals. This actually felt pretty great, as Orry and I rode up together and are good friends. The way you handle adversity will play a huge role in your success as a Magic player. I faced my share of it in this tournament, though, luckily, it was later on in the weekend, and I found a way to fight through it. Thanks for reading, and look for me at Grand Prix Omaha and Pro Tour Fate Reforged! I hope I’ll have some more good news to report.